Jill Larsen believes in the value of continuous learning, and she has spent the last several years increasing her underwriting knowledge and understanding. She recently received her AALU designation as an Associate, Academy of Life Underwriting. This process began several years ago and involved taking multiple courses and passing eight exams. Jill is currently Operations Manager of the Individual Insurance Department at The Bensman Group. She has a variety of responsibilities, but one of the most important is helping to shepherd clients through the underwriting process for life, disability and long-term care coverage. She said underwriting is continually changing and that the work she has done to achieve her AALU designation has helped her keep current on those changes so she can do a better job of finding the best coverage options for her clients. “When I get a client who is applying for new insurance, I am able to identify possible underwriting concerns and ask questions that may help the client,” she said. “I can also work with the underwriters directly on a more advanced level to see what could be done to obtain a better offer.” Jill’s efforts have reduced premium for clients by thousands of dollars and provided higher cash values and death benefits. In addition, she said, different insurance carriers that Bensman works with have different approaches to underwriting. 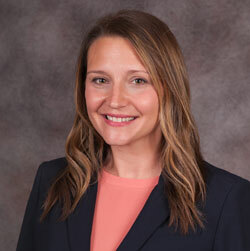 With her long tenure with Bensman – she joined more than a decade ago, shortly after her graduation from Illinois State University – and her greater understanding of underwriting in general, Jill matches clients with carriers most likely to provide the best solution. “When we do our initial interview with the client, I review and identify potential areas of concern,” she said. “Then I select carriers that do well with that specific issue. If necessary, I’ll advocate for the client by positioning the positives of their situation while disclosing all of the facts.” Areas of concern can include health issues, hobbies (such as helicopter skiing), or travel to dangerous locations. Next up for Jill is earning her Fellow, Academy of Life Underwriting (FALU) designation, which involves four more courses and exams. Jill pursues this education because she is passionate about increasing her knowledge and skills and she wants to provide clients with outstanding results. You can reach Jill at jlarsen@bensman.com or 847-572-0804.